For all the Hemi truck and SUV owners. 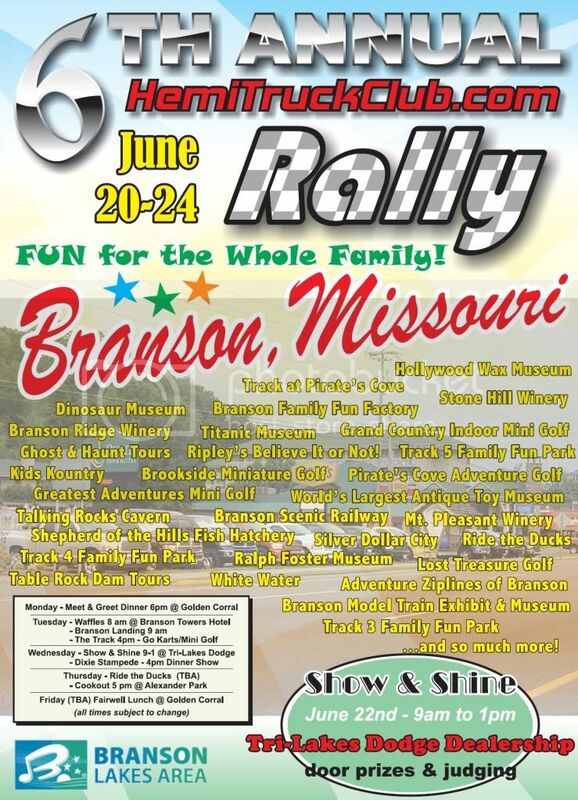 You are invited to join us in Branson, MO for our 6th Annual National Rally. There will be Hemi's from all of the US. The will also be a SEMA 2009 and 2010 feature truck there. Please contact me for details. We be heading out on the 19th and caravaning with 4 trucks from Florida and 1 from Albertville, AL. Samir, I need to find out how to post pics from the Show and Shine event. Let me know where you'll be caravaning from and I'll see you guys off if I can. As far as posting pics, if you need me to host them, just get them to me on a CD/DVD. Otherwise, just post the link to photos here.